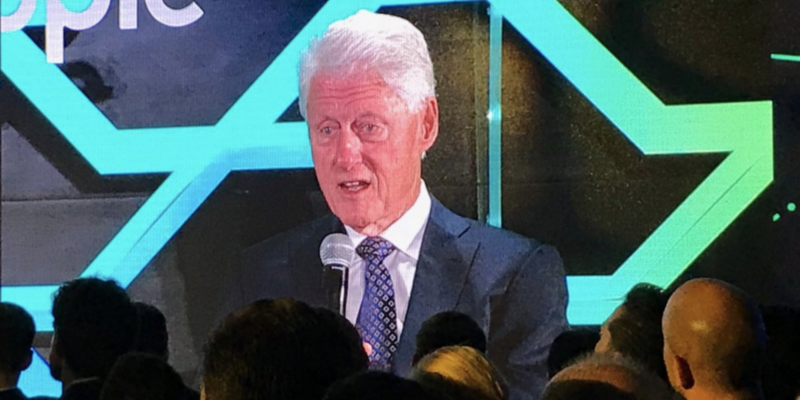 Former U.S. President Bill Clinton didn’t have to say much when he delivered the keynote at Ripple’s Swell conference in San Francisco. And indeed, he barely said anything relevant to the blockchain industry. The 42nd commander in chief has long been recognized for his rhetorical prowess, but there was little pressure on him to rouse or inspire the audience at Ripple’s event. He was sending a message on Ripple’s behalf simply by appearing on stage. Specifically, the company was saying: Ripple is the kind of company that can book Clinton to speak. While Clinton and his wife – former U.S. Senator, Secretary of State and 2016 Democratic presidential nominee Hillary Clinton – have given talks at any number of venues over their decades of public service, the “Paid Clinton Speech” became something of a meme in 2016. During the campaign, critics on the left and right balked at the $22 million Hillary had earned giving speeches to employees of big banks and other establishment boogeymen. The content of these speeches – she refused to release transcripts – became something of a national obsession. To some, they epitomized what was perceived as overly cozy relations between DC and Wall Street. For a company like Ripple, then, there is powerful subtext in booking a Clinton to speak. To understand why, consider the ambiguity of the company’s position. Ripple is a Schrodinger’s cat. In one outcome, we open the box and a thriving fintech company emerges, one that provides a long-overdue efficiency boost to the financial services sector by introducing new, disruptive technologies: blockchain and digital assets. In the other outcome, we open the box and Ripple is just another cryptocurrency company looking for a use case: the company sells tens of millions of dollars worth of the cryptocurrency XRP every quarter through a subsidiary, but as of today, just a few firms are making commercial use of the Ripple product that leverages XRP. Meanwhile, Ripple has been taken to court by small-time investors who allege that its sales of XRP constitute an unregistered securities offering. Perhaps not coincidentally, Ripple has begun to assert that it did not create XRP – indeed, its ownership of the majority of the XRP tokens in existence is down to a “gift” from its creators. Ripple is playing a high-stakes game, in other words, and it has clearly embarked on a campaign to cultivate the right relationships, project the right image and distance itself from the wrong sorts of crypto companies. The push is evident on multiple fronts. Just a few days ago, it was reported that Ripple and others had created the Securing America’s Internet of Value Coalition (SAIV), an advocacy group that will pay its DC lobbying firm partly in XRP. Ripple’s board, meanwhile, includes a former co-president of Morgan Stanley; a former superintendent of financial services for the state of New York, who created the state’s cryptocurrency regulation; a former State Department official, who now runs a D.C.-Silicon Valley consulting firm with two former cabinet members and a former White House adviser; and an official who served in the Clinton and Obama administrations. Former Federal Reserve chair Ben Bernanke headlined last year’s Swell conference, and day one of this year’s conference included four current or former central bank officials – one of whom, Dilip Rao, is now Ripple’s head of infrastructure innovation. Ripple’s choice to book Bill Clinton to speak is entirely consistent with its lobbying efforts, its taste in board members and all the other ways in which it aims to project an image of respectability. Still, the Clinton speech stands out as a particularly potent gesture. Not only does it seemingly vault Ripple into a small circle of establishment firms that book Clintons: Goldman Sachs, Morgan Stanley and Deutsche Bank. It simultaneously distances Ripple even more emphatically from the world of fly-by-night ICOs, dark web markets, Ponzi schemes, tokens, sectarian hard forks and meat-only diets – the “crypto” scene that Ripple clearly wants nothing to do with. Part of the 2016 saga, after all, was Wikileaks, an organization that began accepting bitcoin in 2011 and has generally been popular among cryptocurrency’s more ideological devotees for its extreme anti-establishment and anti-censorship position. The site published damaging excerpts of Hillary Clinton’s speeches to banks in October 2016, just a month before the election. In this context, the symbolism of a paying for a Clinton speech is clear: this organization has nothing to do with the sorts of cypherpunks and anarchocapitalists who donate bitcoin to Wikileaks. As for the content of Clinton’s speech itself, that was unrelated to the real message. As if to drive that point home, Clinton rambled: migrant children being separated from their parents, the lapsed assault weapons ban, the positives and negatives of identity politics, the Rwandan genocide, the movie “Black Panther,” the Israel-Palestine conflict and his new novel all got as much play as blockchain technology. When Clinton did touch on the topic of the conference, it was only to say that money laundering was a risk, but that over-regulation risked stifling innovation. He also warned that toxic identity politics was a risk to blockchain somehow – as a last-minute, semi-coherent segue from the project of Hutu-Tutsi reconciliation following the horrific violence of 1994. Ten years after the financial crisis and the publication of the bitcoin white paper, much of the bitcoin-blockchain-cryptocurrency world is moving away from its anti-establishment roots. But no one is doing it with quite as much panache as Ripple.